Alberto del Rosario's trip to China helps pave the way for a visit by the Philippines' president, officials say. Beijing (CNN) -- The Philippines' Foreign Secretary Alberto del Rosario on Friday ended his visit to China aimed at seeking diplomatic ways for the two nations to resolve the South China Sea dispute. 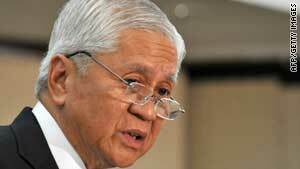 During his two-day visit, del Rosario met with Chinese Vice President Xi Jinping and held talks with his Chinese counterpart Yang Jiechi. The two sides "agreed not to let the maritime disputes affect the broader picture of friendship and cooperation of the two countries," according to a joint statement issued at the end of the visit. "The two sides reaffirmed their commitments to respect and abide by the Declaration of the Conduct of parties of the South China Sea signed by China and the ASEAN member countries in 2002." The two sides agreed to have more high-level visits. They also plan to boost trade and investments, and to cooperate in science and technology, food safety, infrastructure and transportation. President Benigno Aquino III is expected to visit China in late August or early September, the Philippines' officials say. Del Rosario's trip helps pave the way for the president's visit, according to officials. Tension has grown in the resource-rich South China Sea. In June, the Philippines reported increased activities of Chinese vessels in the waters, saying China undermined the regional peace and stability, and infringed the Philippines' sovereignty. The Philippines renamed the South China Sea to the "West Philippine Sea" and removed some Chinese sea markers in disputed waters. China denied the accusation, saying the vessels' activities are "regular activities of patrolling, scientific research" and "survey in the waters under the jurisdiction of China are completely justified and lawful." Chinese Foreign Ministry spokesman Hong Lei urged the Philippines to "stop unilateral actions that impair China's sovereignty as well as maritime rights." Before his trip to China, del Rosario visited Washington and met with Secretary of State Hillary Clinton. On June 28, the U.S. began an 11-day joint naval exercise with the Philippines in the South China Sea. China says it is not to blame. "If you want to know why there is tension in South China Sea, I think you have to go and ask the country or countries that have made all the provocations," Cui Tiankai, China's vice minister of the Foreign Ministry, told CNN last month. CNN's Lorenzo Ferrigno and Haolan Hong contributed to this report.